If you have a site where you would like a carport but it’s in some way challenging – whether it’s because of a slope or other feature – contact Mr Carports before giving up on the site altogether. 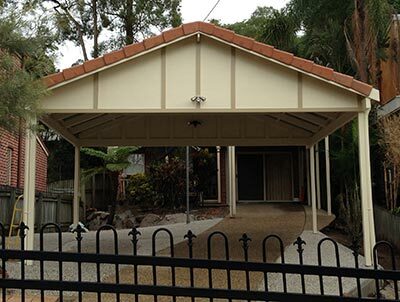 Take for example this Brisbane double carport, built by Mr Carports in the suburb of Kenmore. The site presented a number of challenges but these were overcome and the result is fantastic. The main challenge facing the homeowners in their quest to build a Brisbane double carport was underground sewer and stormwater drains. This was further complicated by a relatively small space for the carport. The tricky circumstances required careful and accurate positioning of the carport – and the close to 2 metre footings – in relation to the drains, which was successfully done without any issue. The other challenge for the homeowners was a sloping site, however, this was easily overcome by Mr Carports’ experienced builders. An interesting sidenote to this Brisbane double carport is the choice of materials, in particular the roofing material. A tiled roof carport would have been ideal to match the house, but didn’t fit the homeowners’ budget. Mr Carports’ solution was to use Colorbond roofing and then install barge tiles that perfectly matched the house’s tiles at the front of the carport. From the street-front, you’d hardly notice the difference! So, while the site may have presented some challenges, the end result is a Brisbane double carport that is as beautiful as it is practical, and certainly worth the effort. If you’re considering building a new carport in Brisbane, give us a call on 1800 557 782. You can also find further information on carports on our Brisbane branch page and on our Outside Concepts’ website.